Dogs are awesome beings. This new documentary called "Dogs on the Inside," directed by Brean Cunningham and Douglas Seirup and produced by Cindy Meehl, who also produced the wonderful documentary called "Buck," will be available Tuesday, February 10, on digital VOD - iTunes, Google Play, Amazon Instant Video, VUDU, and at DogsOnTheInside.com. "Dogs on the Inside" shows how dogs can be catalysts for love and rehabilitation behind bars and how prisons can become foster homes for dogs. Clearly, it's a win-win situation for the dogs and the inmates. As I mention in my interview for this film, the dogs become a lifeline for the inmates - their oxygen - and the dogs also flourish while being rehabilitated and loved. The dogs, many of whom were severely neglected and abused before coming to jail for a good dose of TLC, receive all the love they need and get rehabilitated for later adoption. The prisoners also deeply appreciate the connection with another living being for whom they are responsible. The inmates with whom I've spoken about their relationships with nonhuman animals always tell me how they feel very comfortable in the presence of the animals because the animals trust them and don't judge them. This is very clear in "Dogs on the Inside." In their interviews they tell us how thrilled they are for the deep and personal connections and how the dogs also rehabilitated and softened them. 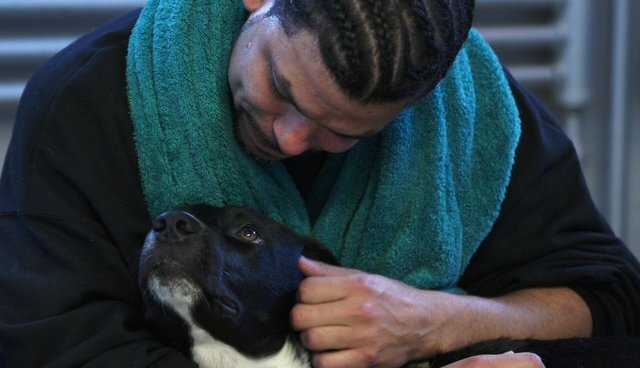 Dogs even become catalysts for bringing former rival gang members together. They break down walls, and one inmate notes that the dogs give him "a taste for freedom." The dogs also provide the inmates with experience for job opportunities when they're released. "Dogs on the Inside" reflects my own long term experience of teaching inmates about animal behavior as part of Jane Goodall's global Roots & Shoots program. It is perfect for audiences of all ages and I hope it receives a broad and global audience. "Dogs on the Inside" is a film that will make a huge difference in the lives of dogs and people in need. I can't imagine watching it only once. It is that good and inspirational.